"President Mugabe of Zimbabwe has murdered more black Africans than even the South African apartheid regime. In just one region of Zimbabwe, in just one decade - in Matabeleland in the 1980s - he was responsible for the massacre of 20,000 civilians. This is the equivalent of a Sharpeville massacre every day for more than nine months. There was a global campaign against apartheid. I was part of it for more than 20 years. Why isn't there a similar global campaign against Mugabe's murderous tyranny? Ooops, silly me. The killer is the wrong colour. He's a black murderer, not a white one. Besides, it is racist and neo-imperialist for anyone in the west to criticise the leader of a developing country, even a bloody butcher like Mugabe." "I will not respond on the subject of Zimbabwe...If you want me to respond invite me back here and I will respond". Nkosazana Dlamini-Zuma after being heckled at the London School of Economics. "The ANC sits on its hands and looks the other way while Zimbabwe burns. Mugabe has murdered more black Africans than the apartheid regime. In Matabeleland in the 1980s alone, he massacred 20,000 civilians. That is the equivalent of a Sharpeville massacre every day for nine months. Yet South Africa does noting effective to stop the killing. President Mbeki's quite diplomacy is a failure. Mugabe's abuses have increased, not diminished." 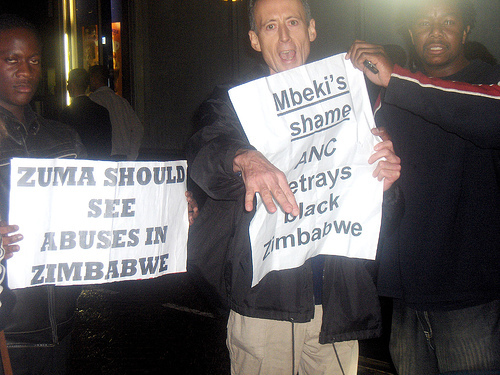 Peter Tatchell, veteran anti-apartheid activist. "Much of the audience was riled by her arrogant, heartless refusal to express even a few words of solidarity with the Zimbabwean people. They urged her to say something. I think she lost a lot of respect because of her intransigent attitude. "It's against nature. It is against what marriage was intended for - to have children. That kind of activity cannot bring life. There is no way we can give a person the right to do something that is morally wrong," Cardinal Wilfrid Napier, president of the Southern African Catholic Bishops' Confederation. "I had only driven it for about 15 minutes when it stopped...it was smoking. I have had 3 gearboxes replaced, the steering rod fell out, the wheel alignment was not done properly" Taxi owner Ben Diergaardt on the GAZelle, an imported Russian minibus aimed at the taxi recapitalisation market, which passed SABS tests. "One of the ANC's greatest 'friends' was the late Brett Kebble. As we know it was the sort of friendship that blossoms only when large amounts of stolen money move in unusual ways". "Calling it the Friends of the President Golf Day immediately politicises what could simply have been a pleasant day's golf, with a light snack of garlic, beetroot and sweet-potato salad at the 9th and a shower in the newly renovated Jacob Zuma Spa and Wellness Centre." "Everyone, with the possible exception of Eskom’s executives, has known that South Africa should have started building new power capacity about ten years ago. The beauty of the Western Cape power outages – which costs businesses at least R1bn – is that blackouts are absolutes. The other kinds of rot that are forcing South Africa into a fully dysfunctional State are less perceptible." "Smunda Mokoena and Thembani Bukula...at The National Energy Regulator of South Africa (Nersa)...signed off a report on the Western Cape power supply interruptions ...The finding was that Eskom, the national power monopoly, had been negligent; had failed in its maintenance obligations, and had breached its licence conditions...Mokoena and Bukula are taking on Thulani Gcabashe, Eskom CEO, who in 2005 was paid R13m by Eskom “including payments on expiry of five year contracts”. These were no doubt silly contracts, because Gcabashe continued in office and this year was paid R5m, including a horrifying R1m bonus. Bongani Nqwababa, Eskom’s CEO, who brandishes a chartered accountant (Zimbabwe) qualification, was also paid millions, along with a bonus. Eskom’s nine divisional MDs cost an obscene R57m in 2005, thanks to those contract expiry payments, but were dirt-cheap this year at R18m." Infrastructure increasingly disintegrates and rots. Nobody seems to give a damn. Jeffrey Thamsanqa Radebe, the minister of transport, has conceded that the country’s road network cannot accommodate the current rate of increase (now at 10% a year) in freight movement on the national roads. The minister of public enterprises, Alexander Erwin, has stated that South Africa's rolling stock of rail assets has shrunk since 1994: electric locomotives numbers are down 12%; diesel locomotives are down 11%, and the coach fleet has contracted by 37%. Since 1994, South Africa’s rail route distance provision has remained stagnant at 22 000km. Chairman of the Portfolio Committee on Transport, Jeremy Cronin, has described the ANC-led government's transport policy during the 1990s as 'disastrous'." "Gauteng...is in the grip of a rat infestation, with rodents, as put in a Sunday Times report, 'as big as size ten shoes', being spotted from Sandhurst to Springs...In years gone by, there would be a municipal rat-catcher who would work himself into a coma to rout the plague. Today, officials just don’t care and rats are becoming as common as dirty public accounts. " “We used to like the ANC because it brought freedom. But freedom is not enough,” Solly Nyathi, an unemployed 18-year-old in Khutsong. "South Africa is such a fraught place to live. The anxiety about crime, the crunching on racial eggshells, the juxtaposition of First World materialism with Third World squalor." "I would even guess that in most instances top students in mathematics or science are girls... then the poor representation of blacks and women in key positions in the economy can surely not be as a result of nature, but a consequence of what our constitution refers to as 'the injustices of the past'," he told pupils at Somerset College in the Western Cape during the annual David Wynne lecture. "...what we do know, is that Zuma's instincts are to bring peace and stability and to stay close to the ordinary people. There is a good chance that he will have a much greater understanding of the alienation of the minority groups than the Mbeki administration. " Max du Preez writing for The Star newspaper. "Every president since PW Botha has had at least one sexual indiscretion that we know of. Every person in power since Jan van Riebeeck has said something really stupid at least once - some current ones do it on a monthly basis." Max du Preez writing for The Star newspaper. "When I arrived at the Union Buildings I noticed that a lot of women were carrying 'babies'. I guess all of us were thinking on the same wave length. What was funny was that these 'babies' did not cry even once during all that commotion." Alzina Zondi, who took part in the 1956 march, recounting that many participants carried a bundled rug and cushion in the hope this would protect them from being beaten by the police. "Why should we forever accept a name given to us by a passing visitor as if we do not know who we are?" Goodwill Zwelethini, the Zulu King, campaigning to scrap the "Natal" from "KwaZulu-Natal" province. "If, instead of creating a small mega-rich elite, the ANC had stuck to the original plan and seen to it that more of its constituents became substantially better off, we would probably not be facing the problems we face today", Sunday Times columnist, David Bullard. "In Zweledinga I met this little girl who lives with her widowed mother and sister. I asked whether her mother received a pension or any other grant and she said, 'No'. Then how do you live? I asked. 'We borrow food', she said. Have you ever returned the food you have borrowed? 'No.' What happens if you cant borrow food? We drink water to fill our stomachs." Tutu writing to PW Botha.